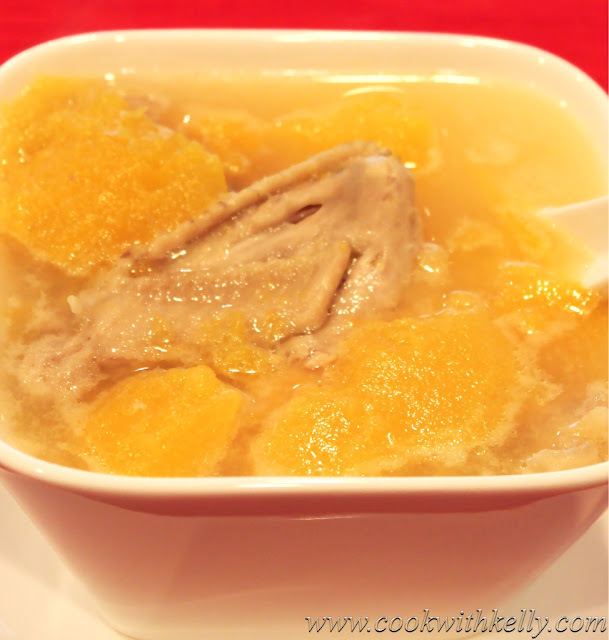 This Red Papaya Coconut Chicken Soup is a very well known Chinese beauty soup. It's so refreshing and delicious! This soup has a tropical taste and natural sweetness from the papaya coconut milk and it makes a great appetizer before a big meal. This soup is easy to make and the same as other slow cooked Chinese soups. It can be stored at room temperature for up to 3 days. Just make sure to boil it for a few minutes before eating or every 24 hour period. Take off the skin and fat from the chicken. Peel the skin from the papaya, take out the seeds, and cut the papaya into medium sized cubes. In a large soup pot, add papaya, chicken, pork back bones, ginger, coconut milk and water. Bring to a boil. Reduce the heat to the lowest, use a soup strainer to strain all the dark bubbles on top of the water. Cook for 3 hours, add salt. Now enjoy your soup!